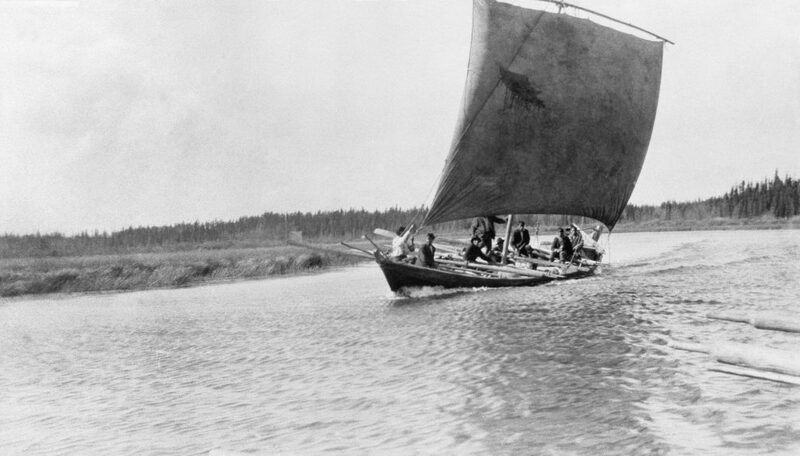 This powerful image of a York Boat under sail is used with the permission of the Glenbow Archives. Its number is na-1847-5. The HBC men sailed these boats anytime the wind was blowing in right direction, both going downriver, and coming upriver. When the men, who travelled in the outgoing York Factory Express from Fort Vancouver, reached Edmonton House, they were absorbed into the Saskatchewan brigades that carried their packs of furs to Hudson Bay. Their experiences would differ from year to year, but the one constant in their journey was the boat they traveled in — the York Boat. York Boats had a major advantage over canoes: they carried a massive load and needed fewer men, and they were far less fragile than a birchbark canoe. They were flat-bottom boats that were about 28 feet long and six feet wide, with a shallow draft that made them suitable for the low river levels they often encountered. York boats were of carvel construction: the boards were fitted edge to edge and tightly pressed against each other, with gaps between the planks filled with tarred length of hemp or manila rope, called oakum. One man who traveled in these boats described the stem and stern posts which were protected with strips of iron. Sharply raked ends helped the boat withstand the shock of collisions with rocks and sandbars, and the flaring sides made it more seaworthy. The keels kept the boats rigid and helped with transportation over portages; the false keel prevented damage to the real keel. Three strong thwarts braced the hull without interfering with the storage of their loads, and a platform in the rear allowed the steersman to push and pull on his enormous sweep oar without stumbling over the packs. The boats also had rudders, which were only used while under sail. The square sails were wrapped around masts and carried inside the thwarts of the boat until they were put into use. Long, heavy oars were also stored inside the gunwales, on top of the loads the boats carried. So this is well and good, right? Well, yes, but there is more to it than that. First of all, take a good look at the image above, and notice where the oars are stored! I’ve looked at this photo many times over and not noticed it either. Then I stumbled on Dr. John Birkbeck Nevins’s manuscript, A Narrative of Two Voyages to Hudson’s Bay, at www.canadiana.org. (By the way, all the documents on this site are now available for research, by anyone). Dr. Nevins came to York Factory on the London Ship Prince Rupert, in summer 1842, and because he was surgeon for that ship, he returned to London with it later that summer. So he spent only a short time at York Factory. Nevertheless, he had lots to say of his experience there. For example, in the fall he traveled upriver with York Boats that were heading toward Oxford House and, perhaps, beyond. He has lots to say of this journey, and its very interesting! As is generally the case, the guide, or steersman, and the bowsman were drunk before setting off. A small quantity of spirits is always given them the day before, to last them during the journey; but this is usually finished before starting. When we set off the wind was fair for going up the river, so we fixed our mast, and set our sail. Any one who has been accustomed to boating at home, would share the dismay with which one of the Orkney lads, who had been a sailor, exclaimed — “And is that what you call a mast?” In truth, it required some degree of courtesy to give it this name. A small pine tree had been cut down, probably that morning, and the branches lopped off, but the bark remained; the thick end was thrust into a hole in the bottom of the boat, and the thin end was the top of the mast. But though the entire tree, it was too short for our boat, so that the whole of the sail could not be hoisted. It is not the custom to use a sail much, and no provision is made for fastening the sail-ropes or “sheets.” To supply this deficiency, the oars were laid across the boat, and when the ropes were fastened, the men were desired to sit upon them, and keep them in their places. Now, take a good look at the image above. Isn’t that exactly what is shown in the picture, which must have taken some years after Dr. Nevins traveled up the Hayes River in the York Boat. I have looked at a number of images of York Boats and this is now what I see, in almost every image. I find it fascinating how reading a single paragraph from an old manuscript can change the way you see things. Anyway, this is what Dr. Nevins said next. And he’s right. We soon came to a turn in the river which deprived us of any further assistance from the wind, when Mr. Lawrence lowered the sail, took it from the mast and oars, and, with the most perfect coolness, hove the former overboard. In this he showed more judgment than I, at first, imagined; the mast would have been heavy and inconvenient in the boat; we were travelling the whole time through woods; consequently, if we should ever again want one, we could pull to the bank, cut down a tree, strip off its branches, and in ten minutes have as good a one, at any rate, as that which we had lost. Yes, indeed — that is very practical, for the Hayes River at least. But what happens when the York Boat is on the North Saskatchewan where there are not the trees available as they are on the Hayes? I think that, at Norway House they picked up good, well-made masts and carried them as far as Edmonton House. On their way out the next year, they might have dropped off their good masts at Norway House, to be picked up on the return journey. But that’s just a guess. What do you think? In fact, my information on York Boats on the Saskatchewan River tells me that “The square sails were wrapped around the masts and carried inside the thwarts of the boats until they were put into use.” So, where there were no easily available trees to use as masts, and where the wind could often be used to propel the boats, the York Boats carried masts and sails with them. 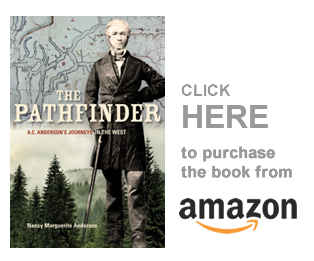 After receiving supplies at Fort Vancouver where generally about a month was passed, and the men enjoyed a well-earned relaxation, the ascent of the river was recommenced. Portages were necessary at various points, especially at the Cascades, the Dalles, and the Chutes… As far as the mouth of the Snake River, a few miles above Walla Walla, the strong breeze blowing up the river, called by the Indians the ‘Chinook Wind’ from the direction in which it came, enabled the voyageurs to employ the sail, thus materially lightening their labour, and at the same time moderating the intense heat of the arid region. Near the Snake River the masts were hidden in the wormwood to be picked up again the following year, for about that point the sail was no longer useful. I enjoy stories like this: it makes you rethink what you think you already know.